NOTE that the printing of HTML format messages may be problematic if the message has too complex a structure for the viewer. In such cases, open the message in a browser (right-click in the message viewer and select Show Message in Browser) as browsers usually handle printing more conveniently and accurately. HTML format messages were not originally intended for very complex layouts, but rather to provide some formatting options not available in plain-text format. Unfortunately some email messages reproduce Website pages (in particular advertising newsletters), and can defeat the viewer used in MailCOPA. The display of HTML format messages used components of Internet Explorer, so ensure your installation is up to date, to cope with changing standards, eg in CSS. 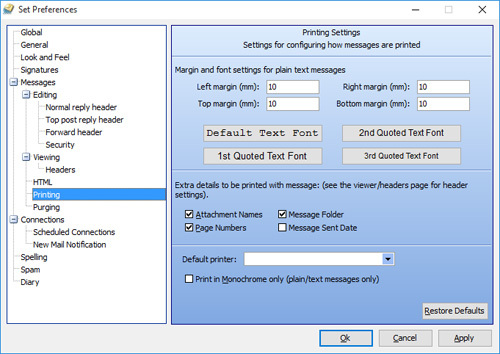 When a message is printed from the Print button or File Print, you will be asked which printer you wish to use (Windows Default will be offered first). If you have selected a default printer on this menu, it will only be used if you use File Print Default, or the Print Default button.